I really meant to write this post a few days ago, but time got away from me with Baby Knives' first birthday directly following Father's Day! Our baby girl is growing up so fast my head is spinning. I'll be writing a baby/birthday-themed post over on my personal blog soon (http://emrohrer.blogspot.com), so keep an eye out for that. In the meantime, I wanted to share two recipes that came together to make the special meal I served up for my husband as a Father's Day dinner. I am about to make a shocking confession, so brace yourself. I have never cooked steak. It's insane really, I love steak and often can find cuts at prices rivaling the cost of chicken or pork, so why not cook it? I just didn't eat it much growing up and am honestly a little intimidated by it! It's just so "wham! ", a slab of beef right on the plate with nothing to hide behind if you over or undercooked it. A little daunting for me. Souffles I can master without a blink, but steak? Scary. Thankfully it turned out beautifully, we like our steaks at mid-rare and they were pretty close. I still want to experiment more and am on the hunt for a winning chimichurri recipe, so send one my way if you have one! 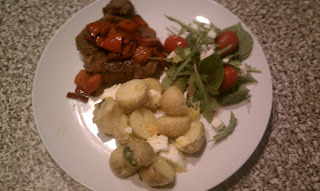 I didn't top the steaks with creme fraiche, but other than that I followed Jamie Oliver's recipe to the letter, so check it out here. I cooked the steaks in a cast iron pan since we don't have a grill or grill pan. The second recipe I tried has become my absolute new favorite version of potato salad. My husband isn't a huge fan of potato salad because he abhors mayonaise, so I've gotten creative over the years with recipes and this one is so simple with clean and bright flavors. Addicting! Needless to say, leftovers didn't last long in our fridge. You really could substitute any fresh herbs you like that would work well with potatoes. Chives or rosemary or tarragon would be delicious as well, but I really enjoyed the subtle minty flavor, which surprised me! 1. Cut the potatoes in half and boil in salted water for 10 minutes, until just fork-tender and still firm. Drain and remove to a large bowl. Peel and quarter the eggs and add them to the potatoes. 2. Whisk the oil, lemon juice, and healthy pinches of salt and pepper together in a small bowl until combined. Pour over the warm potato/egg mixture, stir to combine. Add in the chopped herbs and toss gently to combine. 3. Refrigerate for at least an hour to let the flavors come together - serve up and enjoy!